I loved that job. In late spring, we cleared 100+ miles of trail, carrying a crosscut saw, a bow saw and a couple axes. Before Memorial Day, our boss Tony chainsawed. It rained often, and my boots were rarely dry the next morning. 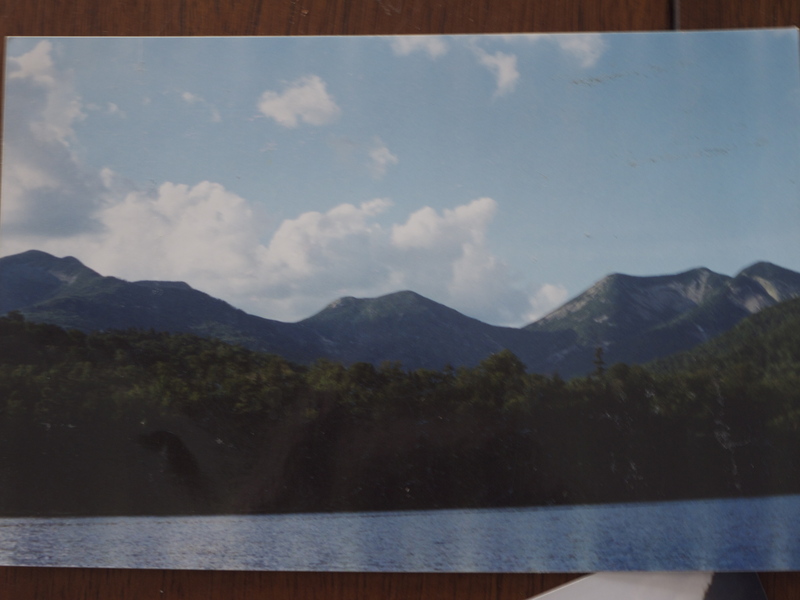 Mid-summer, we’d row two miles up the Lower Ausable Lake, walk a mile to the Upper Lake, canoe across, then spend a week working from a remote camp. We cooked on a big old cast iron stove, and slept in another cabin, where mice ran across our sleeping bags. My mom’s favorite was when I did the row/walk/paddle approach barefoot, and ended up in there for a week with no shoes. Luckily, John Jesse had two pairs, so I wore men’s 10s till my boots were shuttled in. Late summer was the best, because we spent our time building ladders, bridges and stone staircases. Rolling boulders around and throwing mud at each other, trying to build the perfect stone staircase. Rockwork was grounding, and was a precursor to rock climbing for me. Camping and working up Panther Gorge. Asa accidentally stabbed me in the eyebrow with a tent pole when we were setting up an old pup tent. I should’ve gotten stitches. When Kees said, “Hey, Sam’s on fire,” during breakfast. Unbeknownst to him, Sam Brown’s shirt had caught fire. Sam ran outside, dove down the steps and rolled on the ground. New York State’s ‘mandatory hour long lunch break’. We napped, diverted waterfalls, and I practiced throwing like a boy. Alex getting the canoe stuck on a rock. John Jesse got his out mandolin and played, while Alex mucked around in waist deep water. They were 15 and 16, but looked 75 or 80. I laughed until I cried. Asa’s axing obsession. Asa, his lady-friend and I had a Colorado adventure in 2007. They were working in Chicago Basin, home of the crazy pee-licking mountain goats, and I was interning for Rock and Ice magazine. We bushwhacked up Chair Mountain in the West Elks, got cliffed out, and found a cool elk skeleton. Sunrise on Haystack Mountain, next to Mount Marcy. Chewing tobacco and cutting down a tree, simultaneously. Stefan told me, “Put the axe down, Stifler.” I wasn’t used to the tobacco buzz. Finding an old balloon four inches down in the duff, at 3500′ on a mountain where we were digging in a new trail. I’d wondered where helium balloons from the fair ended up. This entry was posted in Back in the day, Mountains, Work. Bookmark the permalink. Your blog post was picked up by the Adirondack Almanak web site, so you may hear from a number of Adirondackers. Glad you are doing well. Trail crew marches on. Come back sometime and row the lake again – sin ropa maybe? Oops, it’s Adirondack Almanack with the “c”s. 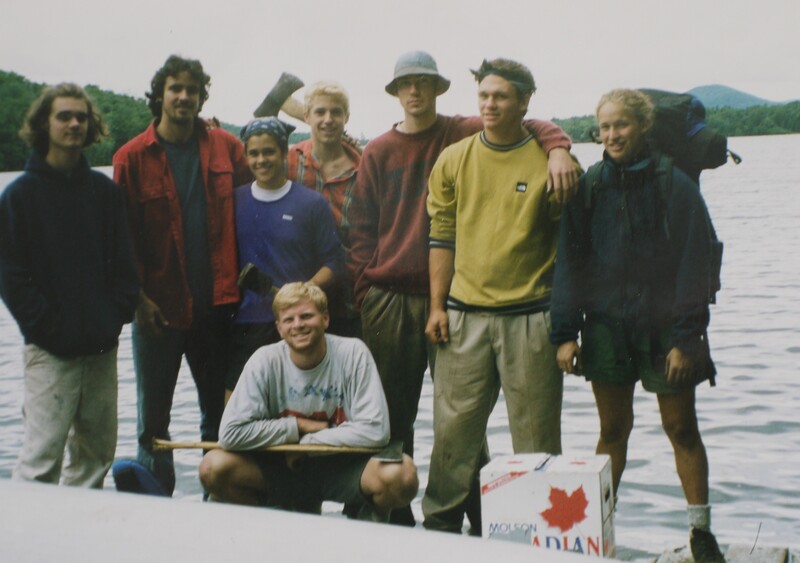 Also, I think your photo is of the 1999 crew. Just discovered your blog, which is way rad. I really liked ‘Heroes Never Die.’ I will probably start to follow it as regularly as I do the weather report in Big Sky and the webcams on moonlight’s website. I also watch Weiland’s old slide shows a lot. It occurs to me that this is weird behaviour, like googling an ex girlfriend several years after breaking up with her. I’ll call the office one of these days to say hi to everyone, but until then please convey my sincere affection to the other moonlighters. And thank you for your blog. Good to hear from you! You are right about the date. That was ’99. I can’t wait to come back to the Lower Lake some day. Hope you are well this winter.